The official start to summer is on Monday and Father's Day is this weekend. Needless to say, SUMMER IS HERE, Y'ALL! And when summer heat comes on, we turn our oven off and try to grill outside as much as possible. A household staple? Grilled personal pizzas. We eat grilled pizzas on our Big Green Egg often, but this past weekend, we kicked them up a notch by adding banana peppers. I have a sort of love affair with banana peppers. When I was living with a roommate right out of college, we were known to eat them for snacks (hi, Lindsay!). Since I am somewhat of a connoisseur, I can say that Mezzetta banana peppers are incredible. Tangy, spicy, and just a touch sweet: the perfect banana pepper. 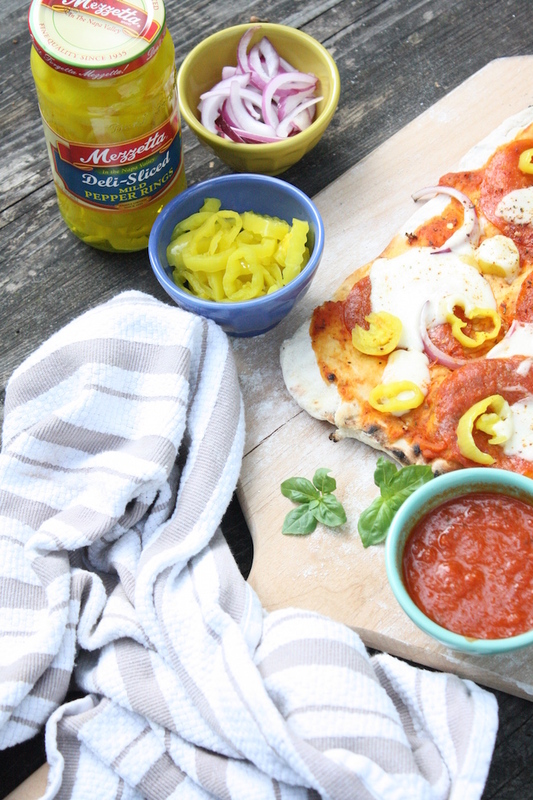 This weekend, we picked up our favorite premade pizza dough from the grocery store, some deli pepperoni (none of the prepackaged stuff), fresh mozzarella, a red onion, and lots and lots of Mezzetta banana peppers. I set up a topping station, and we went to town adding our toppings and creating our masterpieces. Creating a topping station is fun for two, but even more fun with kids or guests. It's such a great way for everyone to get their own pizzas exactly how they want them: no arguing over which toppings to leave off (like onions) and which to add (like more banana peppers!). Hunter and I both agreed that these pizzas were some of the best we've ever made. While I am sure his grill-master grilling had something to do with it, I also have to say that the star of the show was the peppers. If you're ready to create your own personal pizzas, all you need to do is gather your own favorite toppings, your favorite dough & sauce, and get to grilling. We usually like to grill our dough for a minute or two before adding toppings just to make sure it cooks through. Otherwise, you're good to go. 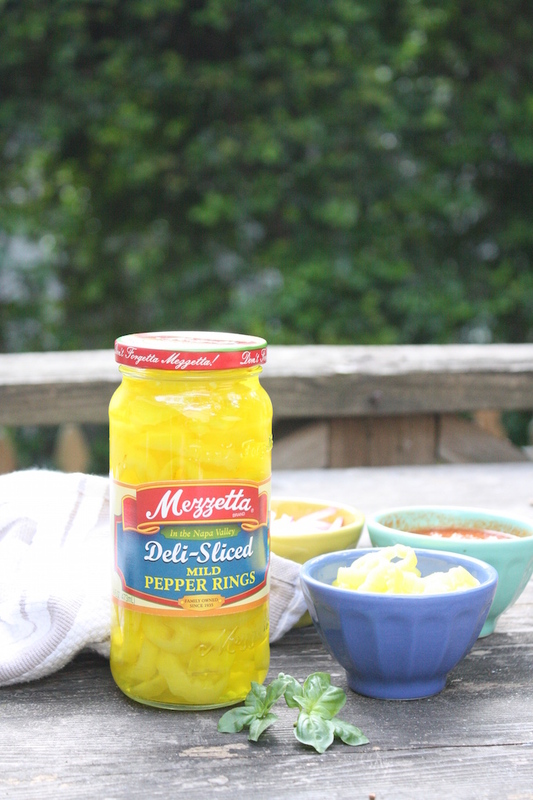 And since it's Father's Day this weekend, why don't you sign dad up to win an awesome giveaway from Mezzetta? He could win the Mezzetta Bold, Bright Summer Giveaway which includes a Weber gas grill, a Weber grilling tool kit, 5 jars of peppers, and a summer entertaining kit. He'd LOVE it! Enter here. What are your favorite toppings for grilled pizzas? Do share! And have a great Father's Day weekend! I love to make personal pizzas like this so everyone is happy! The mild pepper slices are one of my favorite toppings.